New York — In celebration of the two hundredth anniversary of Walt Whitman’s birth, the Morgan Library & Museum exhibits the work of the beloved American poet. In a notebook in 1859, Whitman wrote, “Comrades! I am the bard of Democracy,” and over his 73 years (1819-1892) he made good on that claim. 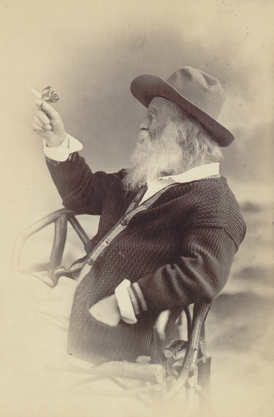 As he bore witness to the rise of New York City, the Civil War and other major transformations in American life, Whitman tried to reconcile the famous contradictions of this country through his inclusivity and his prolific body of work. The author of one of the most celebrated texts of American literature—Leaves of Grass (1855)—came from humble origins in Long Island and Brooklyn but eventually earned a global audience that has never stopped growing. Walt Whitman: Bard of Democracy traces the development of his writing and influence, from his early days producing local journalism and sensational fiction to his later years writing the visionary poems that would revitalize American letters. Drawing on the Morgan’s own holdings as well as exceptional loans from the Library of Congress, the exhibition shows the landmarks of his literary career, including “O Captain! My Captain!” and the famous letter written to Whitman by Ralph Waldo Emerson commending Leaves of Grass. A notebook containing Whitman’s early experiments with free verse and the origins of the seminal poem “Song of Myself” will be on display, as well as the copy of Leaves of Grass that Whitman presented to the artist who engraved his emblematic portrait in the first edition. Also on view are documents by famous writers influenced by Whitman, such as Oscar Wilde, Hart Crane, Federico García Lorca, Langston Hughes, and Allen Ginsberg. The show also explores his attention to the great drama of his time, the Civil War, and Whitman’s emotional bond with Abraham Lincoln. After the war, Whitman’s writing attracted a greater number of friends and visitors, including a number of gay readers and writers who saw him as a liberator and a model for their own path-breaking work. Whitman’s relationship with former Confederate soldier and streetcar conductor PeterDoyle will be another focus of the exhibition, featuring the famous photograph of the two of them together. “It was a joy to work with the Morgan on this comprehensive exhibit, and to see New York City all over again, through his eyes,”said Ted Widmer, guest curator and Distinguished Lecturer at the Macaulay Honors College of the City University of New York. “It never stops moving and neither did he.” Widmer is also author of Young America: The Flowering of Democracy in New York City and many other works of history. The exhibition opens June 7 and runs through September 15.